Great post! What do you think of the subway tile/dark grout combo in kitchen? Is that trendy or here to stay? Thanks! Great question! I’d also love to know your opinion on this. Yes! Surprised this topic wasn’t covered but would love to hear your option too Emily!!! uh oh. The descriptive headers are there, but no photos. Any thoughts on the Eames molded plastic dining chairs? Thanks! I also have a very rustic farmhouse table with my molded plastic chairs and I love the look (plus the chairs are super kid friendly). But I see that combo so much these days, I’m wondering if I will tire of it prematurely….I have a set of vintage wishbone chairs too. But they look so serious with the table that I wanted something more fun once I had kids. Those chairs make me feel like I am back in second grade. I am also too short to be comfortable in them. I can’t wait until we start seeing something new in dining rooms. I have seen some people do some really neat things with vintage chairs and colors. I was wondering the same about Eames chairs. I’m seeing them a lot in Farmhouse styled rooms (which I have) so I was thinking about replacing my Windsor chairs with the Eames to add a touch of Modern. But my husband says they look cheap. I thought they were a classic chair but he started pointing out on TV shows whenever he’d spot one. And they were mostly used in cafeterias or cheap restaurants. They are very affordable so now I’m concerned they will look cheap. I think the black plastic ones are forever, white too (but they get very scuffed over time!). Mix up or matching pastels are probably a few years, or forever if done well. love this post! Already looking forward to the next trend post. It’s wonderful to get some validation that the things I love like two tone cabinets and marble are still going strong. Thoughts on Quartz v granite? What will be the long term countertop de jour?? I’m not an expert, but I love our soapstone counters. They’re equally classic and current. Durable, age beautifully, and they aren’t the same trendy style that granite has/had been. Agree. I’ve done soapstone in two houses now and will do it again and again. 🙁 can’t see any pictures in this post. Always great to hear your opinions on trends. Kitchens are such expensive rooms to remodel so timeless options always appeal to me. Yes yes yes. This is such an interesting and helpful post. This long weekend resulted in some impromptu kitchen reno at our house! And your post is so helpful being reminded/educated on what makes a kitchen timeless. Pinterest has been killing me with trendy-trends everywhere, and forgetting what a timeless kitchen would look like. The photos still aren’t working for me, sadly enough. Same – well the first two are. The rest are not. Me either:( I’ll be checking back in a bit to see if the pictures are working then! Hi everyone! It seems like the blog was experiencing some tiny technical issues this morning (we sympathize, mornings can be tough), but we should be back up and running now, images and all! When I redid my kitchen 5 years ago, I was really into (and still am) the color of brushed nickel, and wished I could have gotten some appliances in that. It’s just a little warmer than stainless steel – as if you took silver and mixed it with a tiny bit of gold. You can find it in fixtures, but not appliances, which would be a nice alternative to the coldness/sterility of stainless. My favourite combination is teak lower cabinets with white uppers, but my current kitchen has avocado green lowers, white uppers and a medium grey countertop. Love reading your thoughts. I like the look of wicker lighting…. But in reality it looks like a major dust catcher. May have to stick with baskets which I can more easily clean. Plus they get covered in grease. That is why it is a no for me. What do you think about brass? I’m seeing a lot of brass pulls in the kitchen lately. Yes! Please let us know your thoughts on this as I’m about to change out all my kitchen hardware to a brushed brass. Great trend round-up! I’ve been fantasizing about cement tiles or cool-shaped tiles for my backsplash. Here in New York everyone is still obsessed with the white subway tile/dark grout look. I love it, but I’m also so over it because it’s been done a billion times. Great post. I’m among those that have open shelving, and yes to all you said. Glad to know I made all the right choices:). LOVE this post! Great work, Emily! Thank you for this post! 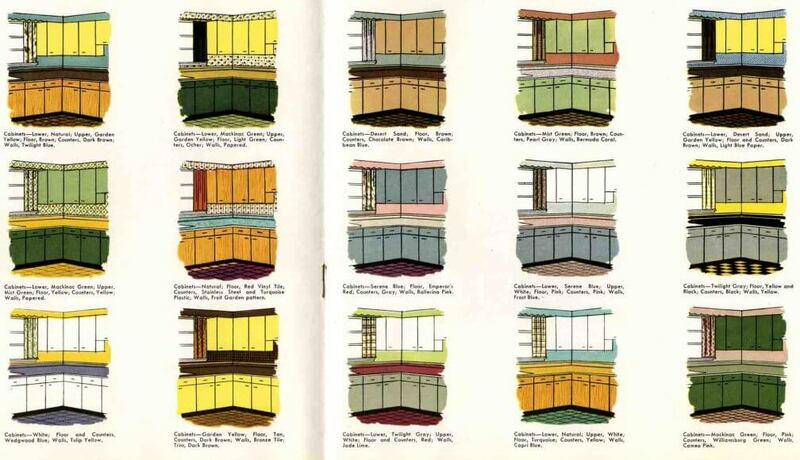 We will be designing a kitchen this year, so this information is really helpful. I’m wondering how you feel about waterfall countertops?? I could NOT do stainless steel cabinets (or countertops). I don’t even like my SS appliances. Too much work to keep clean, too easily scratched and dented, and it all looks like a restaurant kitchen– industrial, cold, clinical and no personality. Blech. I love this post!! Kitchen finishes always throw me off. Oil rubbed bronze? brushed nickel? CHROME?! But that stainless steel kitchen. Swoon. I don’t know if I could live there but it sure is pretty to look at!! Loving the sources to the farmhouse style chairs as well. The struggle to make farmhouse (I can’t say ‘country,’ I just can’t) look chic is REAL. (Because really I have a love affair with that California eclectic too…) Maybe I’ll start my own style… Southern Eclectic… Anywho, Thanks Emily!!! Great post! The multiple handprints on that copper stove vent are hilarious! I came down here to see if any else noticed! I love the copper and the traditional farm house looks. I’m really into incorporating modern elements into traditional style and that’s the look we’re trying to go for in our new home right now. I really love the look of the open shelving but I don’t think we could pull it off in our house with two little ones! I love charcoal gray walls and patterned tiles. I would never install patterned tiles because we are not wealthy and there are certain trends that are pricey to remove (labor etc.). I like a clean palette like a blank canvas and work my way around it so that when a trend goes, I can change without too much of an expense. But if I was wealthy, well, I’d go crazy with anything! I am loving all of these. I would be pretty scared to paint my kitchen black, even though I have quite a bit of light. We are working on a mother-in-law suite addition and I cannot wait to make it all bright and white! Thanks for all the great ideas. One thing is missing – CONTEXT. in my opinion the appropriateness of any design decision (trend or not) depends on the surrounding home. that is what it is all about for me. Emily has said that before, and here she says that Shaker style doesn’t work in a high-rise condo. EMILY!!! When I read that you were changing things on your blog late last year, I was a little nervous. But holy cow, you are hitting it out of the park with all these wonderful design posts!!! Your posts on the biggest design regrets, and on avoiding faux anything (amen sister!) were great, and now you hit us with this round-up of kitchen trends?! I am just loving it! Anyone can cruise pinterest and repost a bunch of popular pins, but you give us the whys behind it all, and what your educated thoughts are so we can grow as well. That just puts you and your blog in another league all together. Thank you, thank you. I am so excited to see what you have in store for us next! Agreed! This is by far the most informative, thorough, and well thought-out design blog out there. I look forward to 6 am (before the kiddos wake up) every morning! Ha! For me, it’s my 8:05am treat…. Once the kids are at school! I completely agree. I’m always thinking, “I wonder what Emily thinks about ____.” I’m loving these new posts so much! I love beautiful wood cabinets in a mid-century home. For a traditional/contemporary home, I love the stacked-cabinet “trend” it looks traditional enough to be timeless, but we really didn’t see it so much until recently. Goodbye soffits and that empty space above the cabinets. Understand what you mean, but it is doable. I have done all my everyday plates, bowls, cups, and serving bowls and platters and pots and pans on shelves and loved it. It worked bc they were used regularly and I kept the cups upside down to prevent dust. Cabinets were for less-than-pretty bakeware and plastics. Was easy even for hubs to maintain because it was so basic: all dinner and serving-ware and pots out, everything else in. Only one color and type of each thing, so pretty fool-proof. I love your perspective on these trends! My fav is the glass front cabinets and the open shelves because I am OCD and can keep them organized!! Great post! I’d also like to know your thoughts on colored cabinets, I’ve been seeing more blue lately and I like it, but I’d be afraid to paint mine and then have it go out of style. I’d also love to see this post about bathroom trends. I own a 1913 craftsman and am loving subway tile, dark grey, open shelving, brass ect, but i love this article because now that I finally have a house I fear trends and am leaning towards more timeless historic but still hip. subway tile will always be in I think, but brass is one. . . . I LOVE it right now but c’mon, don’t you think in 10 years we might be like “remember when brass was everywhere?’ What do you think. You touched on copper and I know you are using a lot of brass, but seriouslly, you don’t think geometrics and brass are going to be so 2015? I think that anything that is historically accurate (or period referenced) weathers the trends better that other options, meaning that while subway tiles may be a “trend” in new construction, they are certainly an historically accurate option for a house built in the early 1900s. As for brass, like anything, there is good brass and bad brass. Brass has been used around water FOREVER. I sail on a 200 year old tall ship, and believe me, it’s not just a trend there. I agree with you. I agree with good brass and bad brass. I just worry the “good brass” i like, I worry I wont’ look at it the same day one day. There are certain things with kitchens I used to love like black and white checker floors and stuff (for example 15 years ago) that I am so over now. I guess that’s my point. Things I thought were sure fire, charming and timeless. . . . I’ve been proven that I am officially over them. I also get really confused and feel anxious about brass fixtures but then does that mean everything has to be brass or some chrome or nickel in there is fine. . . ???? For example, I will probably recreate craftsman cabinets with historical latches. They make the latches brass too, I saw a great post on 1912 bungalow that used brass latches, but silver is more accurate. I also know my husband would probalby scream at that much brass. I guess that’s where I get confused. vintage stove with silver, silver latches, but then brass sink and lights??? I can’t figure out the balance. I would always go for shaker cabinet on a craftsman house. Pulls and paint can change a hell of a lot easier than cabinets if they become dated. I love marble and the two tone cabinets! If someday we buy our own house i will consider these two. But i am staying away from open shelving! Who’s gonna dust them all the time? No, thank you! Until then, we are lucky enough to be healthy and enjoy our family! A couple shelves really isn’t a big deal to occasionally dust. You wipe down your counters all the time anyway. The DISHES, though… That would be a pain. I loved my shelving but purposely only kept out pieces that we used frequently. Dust wasn’t an issue. Great post! Love the organic woven light trend but not sure I would adopt it…how is it to keep clean in a busy kitchen? I would disagree with the “metals never go out of style” comment. 80’s shiny gold faucets were very out of style for a long time, only now making a comeback, but still not in the cruise ship gaudy shine! The oil rubbed bronze (blech) is the shiny brass of now. We were thinking of matte black faucets to our bath, but then decided on shiny polished chrome or nickel. It seems like a less trendy option, that would last. Plus the matte black was hideously expensive! I say, stay away from dark faucets. We are replacing ours as they REALLY show mineral deposits. And the minerals go further as to actually eat away at the finish, so it’s not just a matter of keeping them clean – they are dissolving! I think classic chrome always looks clean and crisp. Agree with you on everything except the basketweave pendants. They’re fine so long as you don’t cook in your kitchen or you’re a compulsive duster. Our kitchen is a standard kitchen flip, which came with the house when we bought it 2 years ago. I’m not a fan but I’m too scared to change it because anything kitchen related is so expensive. I did, however, create the kitchen that I really wanted (open shelves) with our Airbnb guesthouse. I’m so glad that you’re predicting that open shelves are here to stay because even remodeling that tiny kitchen cost way more than I had anticipated. Hey! I designed that shiplap kitchen. Thanks for sharing. I would also like your input on white subway/dark grout backsplash. Thank you. Love your take on these trends, with two exceptions: the plywood (no, just NO!) and the copper. We once rented a vacation house with copper in the kitchen and it was a disaster to clean. Even after it was cleaned, it still looked messy. Copper is way too fussy to be functional, in my opinion. I love open shelves. Ten years ago, we bought a 100-year old craftsman home that had open shelving along one wall of the kitchen. I was certain that we would be swapping those out for traditional cabinets within a few months. Surprisingly, they quickly became one of my favorite features of our kitchen. I don’t know what kind of messy you’re talking about. I’m a copper lover (like Emily) so I’m still gonna use it for my home. LOVE hearing your thoughts on Kitchen Trends! I feel like I could love basket lights for ever and ever. And the two toned cabinets is so fun. Great post! I find it hard to follow the words first, then pictures with no clear headings in between them. I love this post. I hope it is a regular series. I have a question. Two tone cabinets, dark on bottom, light on top. How do you handle full length cabinets, like fridge casings and pantries. I note that you painted yours white, like the upper cabinets. Is that a general recommendation or specific to your choice of white appliances. As always, I am still loving your blog for the great tips, good resources, and of course your joyful, humorous spirit. I think you can go either way (the upper or lower color) with full length. For example, if you had a full length pantry you could have it go the dark color for the whole way. Here is a great example where they did that in the kitchen and I think it looks great! Great post, as always! We just moved into a 1962 southern two-story house, and I love everything–except for the original kitchen. I can’t wait to tear it out. Hopefully whoever has this house after me in 50 years won’t think the same of my own kitchen remodel! Love this post, Emily! We are modeling our kitchen after one that you have photographed above….. with the charcoal cabinets and subway tiles inside and clear glass. How do you feel about farmhouse sinks with the exaggerated restaurant style faucet? I have a farmhouse sink in my kitchen and I love it! It’s huge and very easy to clean, and it looks adorable. I don’t understand the comment about the longevity of plywood cabinets. Plywood is far preferable (and more durable) than MDF, which is what a lot of cabinet boxes are made out of. I get that the look of exposed ply isn’t for everyone, but I’d bet most of the cabinets you see here are plywood, with *maybe* solid wood fronts. One shelf or open shelves will never be me- I am not that neat! I know this, as much as I love the look. The stainless steel I love, but boy does it need to be warmed up. If you cover the bag of groceries in the first example, removing that organic element, you’re practically left with an operating room. Now, with a gorgeous butcher-block table instead of the cafe table foreground, maybe a cutting board or wood fruit dish, the space is warmer. I’d also add a rug for the cat. Perfect timing as I was just about to start DIY a little kitchen makeover. I have builders grade oak cabinets that I can’t afford to replace and an ugly slate blacksplash. I plan on painting the cabinets gray, doing a subway tile with dark grout backsplash, and getting gold hardware and faucet. I don’t really care about it’s longevity and am just going for what I like right now. Eventually I plan on doing a complete kitchen reno, but for now anything is better than the awful oak. I can’t wait!! I love the 1st photo on the shiplap wall kitchen section and would love to see more pics of this kitchen, but the source link doesn’t seem to work. Can you re-share it? Although I love open shelves and one shelf I know I am nowhere near neat enough to make that look. I love the stainless kitchen with the herringbone wood floor, but the grocery bag adds so much warmth to the space, once it’s gone you could do sugery in there! It needs some more wood- like a butcher block or reclaimed wood table where the cafe table is. Or maybe some color in a rug. And a cat. I would LOVE to see more designers using wood stained cabinets & trim. I have stained trim in my home & all of this white everywhere does nothing for me. It looks good but I’m not going to paint every bit of wood in my home to get that look. My stain is medium/dark, so it’s not out of date light oak. I like it & have found that gray paint really keeps the stain from looking brassy. And having stainless steel appliances – hell no. I’d never have cabinets in it and will never buy stainless again! What a great, smart, interesting, thoughtful post! Thank you! LOVED this post. We are planning on re-doing our kitchen and it was great to see your perspective on current trends and how long you anticipate them to last. I definitely don’t want to put a lot of money into something that is going to be completely out of date in a few years! Yes! Yes! Yes! Awesome post. Re: black kitchens. What a great way to go bold in the kitchen while still really remaining neutral. Pair with the basket lights and windsor/shaker/farmhouse style chairs, and the space will become really warm and inviting. I do really enjoy copper accents but could never make it a big feature. I’m toying with the idea of simply purchasing a copper floor lamp but get the feeling in the next 10 years, I’ll be sick of it. A simple grey or off white would have a lot more longevity. I think marble is beautiful, when done right, and adds so much lightness to a room and feels so different but calming in a kitchen. Really like the layout and content of this post. Of course, I will never agree with the open shelving trend: I have open shelving out of space necessity, and I find it aggravating. Yes, it looks wonderful, but I’m constantly dusting pieces off before I can use them. Such a useful post! I love most of the styles here, especially the dark cabinets, copper accessories, marble, open shelving etc! Unfortunately, open shelving would likely be a romantic dream… or maybe I could do with a couple of open shelving just because. Ah we’ll see. I’m not a very neat person you see haha! I would definitely add under counter appliances to this list, well at least I added those to my list a bit earlier when I stumbled upon a website called huhudesign.com and I couldn’t help myself…long story short, my kitchen is being remodeled using quite a few under counter appliances. Churn soft is a best Accounting Software Company in Hyderabad,Several companies have chosen CHURN as a strategic partner to help them manage key areas of IT, due to our deep capabilities in industry verticals, technical strengths and innovative, flexible service delivery. Im doing a new kitchen (newly built home) and have gone for a glossy white cabinet and super long white island with ‘organic white’ ceasar stone benchtops – Ive decided on a Smokey blue large subway tile which I’m having my tiler lay in a herringbone style with white grout – I think the room being a large open plan needs a splash of colour so fingers crossed I don’t regret it!?! gah…im nervous! Oh man, fun run down, but you say everything has a long shelf life. So then it’s not a trend. They can’t all be trends. I’m sure someone said they thought travertine and oak cabinets would be forever, too.